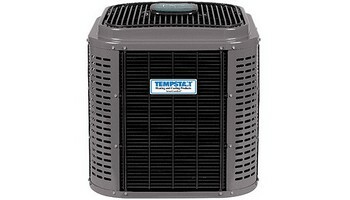 Tempstar Two-Stage Air Conditioner The two-stage scroll compressor operates most of the time at the quieter, lower stage, changing over to the higher stage at higher outdoor temperatures to produce more cool air. A deluxe sound blanket also reduces compressor sound levels. Enjoy comfort without compromise, thanks to our variable-speed air conditioner with Smart Sense technology. This whisper-quiet system senses changing conditions and adapts so you can stay comfy with outstanding efficiency. And when it gets extra hot and sticky outside, you'll feel the difference with enhanced dehumidification inside. For maximum performance along with the convenience of remote access, pair it with a complete Observer communicating system, including the energy-smart Observer communicating wall control with Wi-Fi capability. Quiet performance (as low as 56 decibels)*5 stages of variable-speed compressor operation, providing our best temperature and summer humidity control High-efficiency variable-speed fan works with compressor for our best levels of quiet, efficient operation Durably built with tight wire grille and protective corner posts to withstand bad weather and debris Designed for corrosion resistance and lasting performance Wi-Fi enabled remote access with the Observer communicating wall control 10-Year No Hassle Replacement Limited Warranty+10-Year Parts Limited Warranty±,Beat the heat with our highest-efficiency air conditioner featuring a two-stage compressor and variable-speed fan that quietly delivers optimum comfort and better levels of humidity control with up to 19 SEER. Pair it with a complete Observer communicating system, including the Observer communicating wall control with Wi-Fi capability, for the convenience of remote access along with improved energy-saving performance and comfort management. Hot weather is no match for our high efficiency air conditioner with a two-stage compressor that quietly delivers enhanced comfort and better levels of humidity control. Pair it with a complete Observer communicating system, including the Observer communicating wall control with Wi-Fi capability, for the convenience of remote access along with improved energy-saving performance and comfort management.